Related video report by William Ide. As China flourished its military power in a spectacular parade Thursday commemorating the victory over Japan in World War II, President Xi Jinping announced he plans to cut the world’s largest military force by 300,000 - by more than 10 percent. In a speech he delivered shortly before a stream of tanks, ballistic missiles, drones and goose-stepping soldiers rolled through Beijing's Tiananmen Square, Xi said the troops cuts are in the interests of peace, and said his country has no interest in controlling its neighbor states or expansion that would harm other nations. "China will remain committed to peaceful development," President Xi said as he announced the Chinese armed forces will be reduced from 2.3 million service members to 2 million. "We Chinese love peace," he added. "No matter how much stronger it may become, China will never seek hegemony or expansion." Officials said the troop cuts will be completed by 2017, and that they are not expected to weaken China's military. Defense spending has been growing by at least 10 percent annually for years, part of a long-standing effort to modernize the armed forces. And for about an hour Thursday, China put that modernization on full display. 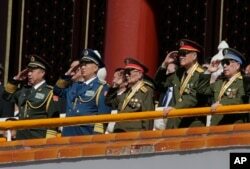 Chinese military officials salute during a parade commemorating the 70th anniversary of Japan's surrender during World War II held in front of Tiananmen Gate, in Beijing, Thursday, Sept. 3, 2015. The parade, with its 70-gun salute and release at the end of thousands of doves and balloons was both a solemn reminder of the China’s past suffering and celebration of its accomplishments. However the overtly military spectacle again raised questions about China’s rise and the role it seeks to play in the world. Over 12,000 troops marched into Tiananmen, followed by an impressive array of tanks, drones, fighter jets, and nuclear-capable intercontinental ballistic missiles. Ahead of the parade, state media had said that 84 percent of the equipment on display would be making its public debut. The message the parade is sending is slightly contradictory, said Kerry Brown, director of the China Studies Center at the University of Sydney. On the one hand the parade is directed at a domestic audience and aimed at showing the government is strong and is defending the country’s interests. One the other, Brown said China is telling the rest of the world not to worry about China as a threat. “What he’s [Xi] saying is to his own people and to the rest of the world, China is strong enough not to be pushed around, but he’s not saying China is ready to start pushing the rest of the world around,” Brown said. Chinese President Xi Jinping is displayed on a screen as Type 99A2 Chinese battle tanks take part in a parade commemorating the 70th anniversary of Japan's surrender during World War II held in front of Tiananmen Gate in Beijing, Thursday, Sept. 3, 2015. China has not seen any military conflict since 1979, and because of that it has no battlefield experience using the equipment put on display. “The biggest problem for the PLA is integrated warfare, which it has never experienced before. Integration is essential in modern warfare,” said Michael Raska, a research fellow at the Institute of Defense and Strategic Studies in Singapore. China’s military “has a problem integrating the navy and the air force because of its rigid hierarchy, inter-service rivalries and lack of decision-making powers at the command level,” he said. The cut in the number of China’s forces was widely viewed as part of the long-running effort to modernize its military. Brown said that the upcoming visit of President Xi to Washington will be a good opportunity for the two countries to deepen their political and military dialogue so they don’t misunderstand one another. “I think the biggest danger is misunderstanding. That’s where the real problems are,” Brown said. Raska, the research fellow at the Institute of Defense and Strategic Studies in Singapore said the reduction in forces is a signal that President Xi is initiating a new round of military reforms. China is in the midst of an ongoing effort to shift its focus from territorial ground defense more toward maritime and naval strength. Some, however, felt the parade could further fuel an arms race that is already going on as China seeks to address what it believes are its territorial claims in the South China Sea and East China Sea. It is also trying to build an arms market and the parade could help with that. 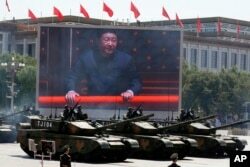 “China’s number one aim is to threaten Japan. It also wants to demonstrate the success of its military modernization program,” said Dipankar Banerjee, a retired major general of the Indian army, and a mentor at the Institute of Peace and Conflict Studies in New Delhi. In Japan Thursday, chief cabinet secretary Yoshihide Suga reacted to the military parade by calling for all sides to look forward. "I would like China to show its future-oriented attitude to work on common issues which international society is facing, not focusing excessively on the unfortunate history in past." Chinese female military personnel march during a parade commemorating the 70th anniversary of Japan's surrender during World War II held in front of Tiananmen Gate, in Beijing, Thursday, Sept. 3, 2015. Beijing’s tensions are not only with Japan. China’s actions in recent years, both in the East and South China Sea have strained relations with other neighbors and according to a recent survey, hurt China’s image across the region. The U.S.-based Pew Research Center this week released a poll, which said that while 57 percent of those surveyed across Asia have favorable view of China, those in countries such as Vietnam and Japan had a sharply different view. In Japan 9 percent had a favorable view and 19 percent in Vietnam. Respondents from six of the nine countries near China all cited concerns about territorial disputes with Beijing. In the Philippines, 91 percent voiced concern, with the Japan and Vietnam following close behind with 83 percent each. The heads of state from almost all of the countries that have territorial disputes with China did not attend the parade. Vietnam was one of the few standouts. President Xi and his wife Peng Liyuan welcomed dozens of world leaders to he event. Some of the more prominent participants included United Nations Secretary General Ban Ki-moon, Russian President Vladimir Putin and South Korea’s President Park Guen-hye. In all some 30 leaders attended, many of them from countries that were founded after World War II. Russia was the only other ally from the war to send their leader to the parade. Joyce Huang and William Gallo in Washington and Youmi Kim in Seoul contributed to this report.